This little guy is the most common Scleroderma species in my area, central Illinois, but it is found throughout eastern North America, growing in grassy areas and in disturbed ground (under my landlady's picture window, for example). It is fairly small, and it blushes purplish red when bruised. With age, the surface begins to develop pinkish cracks and, occasionally, tiny scales. A drop of KOH on the surface produces a red reaction. The spores of Scleroderma bovista are very spiny, and partially (not completely) reticulate. They measure 11-16 µ, officially, but specimens from my area have spores that are consistently a little smaller. 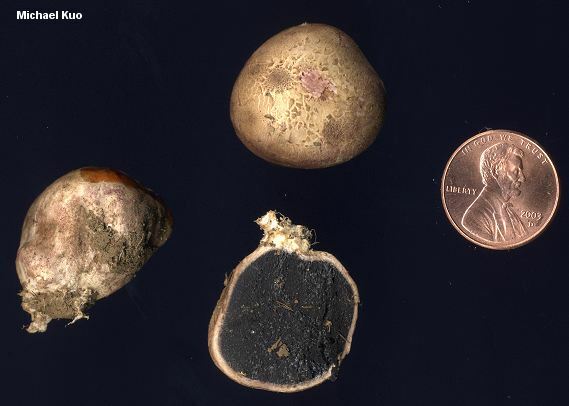 Scleroderma lycoperdoides var. reticulatum, originally described by Coker & Couch (1928), may be a synonym, according to Guzmán (1970). Ecology: Probably saprobic, but possibly mycorrhizal with hardwoods; growing alone, scattered, or gregariously in open areas; usually in grass but sometimes in disturbed-ground (ditches, path sides, and so on); fall; probably widespread in eastern North America. 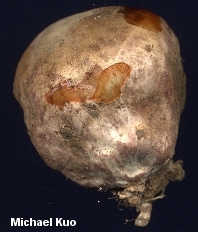 Fruiting Body: 2-5 cm across; round or nearly round; occasionally with a small, pinched-looking pseudo-base; surface smooth or very finely scaly, developing small pinkish cracks with age; dirty whitish to pale tan; bruising purplish red or pinkish when rubbed; skin about 1 mm thick, whitish but turning pinkish or purplish when sliced; odor not distinctive. 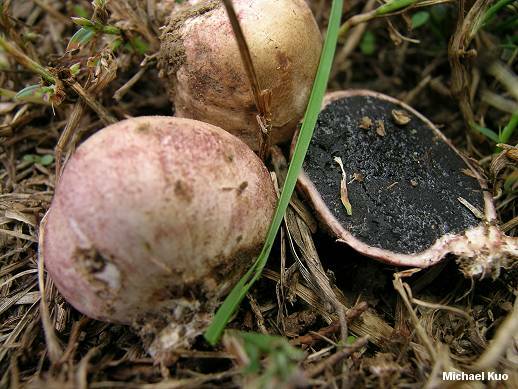 Spore Mass: Black and hard, with scattered whitish threads; eventually powdery. Chemical Reactions: Fresh surface instantly red with KOH; dried surface reddish brown or yellowish brown. Microscopic Features: Spores 11-15 µ (including ornamentation); round or nearly so; densely spiny; partially reticulate; with spines up to 2 µ long. In my collections the spores are consistently 8-11 µ (including ornamentation). REFERENCES: Fries, 1829. (Saccardo, 1888; Coker & Couch, 1928; Guzmán, 1970; Metzler & Metzler, 1992; Bessette, Miller, Bessette & Miller, 1995; Sims, Watling & Jeffries, 1995; McNeil, 2006; Miller & Miller, 2006.) Herb. Kuo 09280501, 09300504, 10040511.